A recent study reveals new information on how we use our game machines, showing that the role of consoles as multi-media devices isn't just PR hype. Unsurprisingly, the study, conducted by the Nielsen research firm, found that the primary use of game machines is ... gaming. 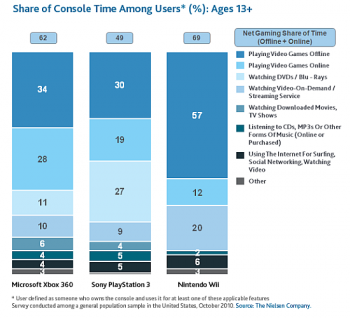 What is surprising is that though gaming is the most used single function, approximatively 51% of time spent using the PS3 is spent on non-gaming pursuits, far more than the 360 despite Microsoft trying to pimp it as a living room media hub. The presence of a Blu-Ray player on the PS3 may have something to do with that, with 27% of PS3 time being dedicated to watching DVD's and Blu-Rays, versus 11% on the Xbox 360. Another interesting facet of the data is the amount of video streaming and video-on-demand the Wii does. Compared to only 10% on the Xbox and 9% on the PS3, the Wii is a streaming juggernaut, weighing in at a full 20% of its time spent streaming movies and videos. The Wii also takes the lead in offline gaming time, with a full 57% of its time spent playing offline games, while the runner up in the category, the 360, only hit 34%. Nielson also released stats on how much each console is used per household per week. The Xbox 360 comes in at the head of the pack, getting an average of 4.9 hours of use per week, closely followed by the PS3's average of 4.1 hours. The Wii trails behind, perhaps because of the casual gamer audience it has captured (who are less likely to spend unending hours obsessing over a game), coming in at 1.4 hours.